1. Soak 8 large wooden skewers in water for 30 minutes. Meanwhile, cover the potatoes with cold water in a medium saucepan. Add a generous pinch of salt, bring to the boil and simmer gently for 14 minutes, until just tender to the point of a knife. Drain and set aside to cool slightly. Slice each block of halloumi into 8 chunks (to make 16 slices in total). Likewise, slice the peppers into 16 pieces, discarding the seeds, core and membrane. 2. Gently toss the peppers, halloumi, potatoes, rosemary sprigs and chilli fl akes with the oil in a bowl, being careful not to break the cheese up; season. 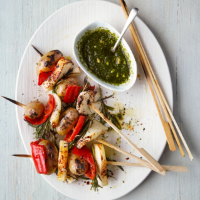 Thread the ingredients onto the skewers tightly, making sure each one holds 2 potatoes, 2 cheese chunks, 2 pepper slices and 2 rosemary sprigs (tightly sandwich these between the other ingredients rather than skewering them). 3. Place a griddle pan over a high heat or preheat a barbecue. Griddle or barbecue the skewers for 4 minutes, turning every minute and pressing them down in places while they’re cooking, until well marked. Serve with the pesto alongside or drizzled over the top. This recipe was first published in Thu Apr 26 12:05:28 BST 2018.